Mega-sushi platter, Koko's. I could have eaten it all myself if there weren't 5 other hungry people at the table with me! I have always, perhaps unfairly, been a bit suspicious of Japanese restaurants where the staff and chefs are not, in fact, Japanese. I think it comes from my years of being a poor student, when I would have many a cheap (and often nasty) Japanese lunch at pan-Asian "Japanese-style" restaurants in Chinatown, where I would eat massive bowls of rice covered in tough beef or dry chicken, and leave full, but not thoroughly satisfied. But let's get back to the point. My brother chose super-slick and beautifully designed Koko's at Crown for his recent birthday dinner, where head chef Allan Koh, as you can tell from his name, is Malaysian. Previous prejudices aside, I think it is often exciting to eat food prepared by a non-native yet passionate chef, as he or she will often bring new persepectives and developments to an established tradition. In the case of Koko's, think of dishes like deep-fried soft shell crab with zucchini flowers, braised Wagyu spare rib in mirin soy broth, topped with foie gras and porcini mushroom sauce. It's a bit of a change from traditional Japanese fare, and no less delicious for it. 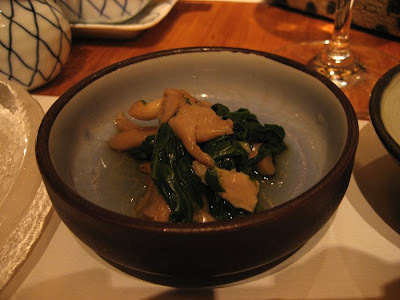 An amuse-bouche of mushrooms and spinach. Tori Sanshoku - Chicken prepared 3 ways. 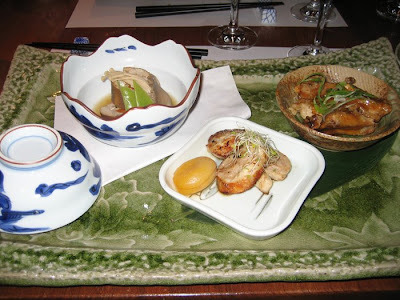 From right to left: Deep-fried chicken rib glazed with dashi vinaigrette; grilled marinated poussin with yuzu pepper; poached Maryland chicken in light soy broth. My 2 dining buddies who ordered this dish reported that neither of them liked the poached maryland chicken, but enjoyed the other ones. 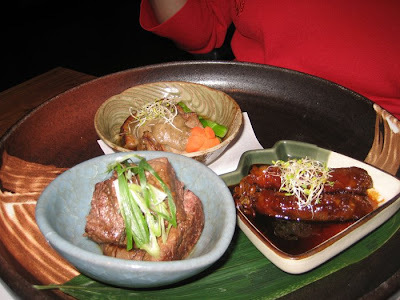 Gyuuniku Sanshoku - Beef prepared 3 ways. Clockwise from back: braised Wagyu spare rib in mirin soy broth, topped with foie gras and porcini mushroom sauce; Wagyu enoki roll; grilled Wagyu tenderloin with garlic butter sauce. Three kinds of delicious! 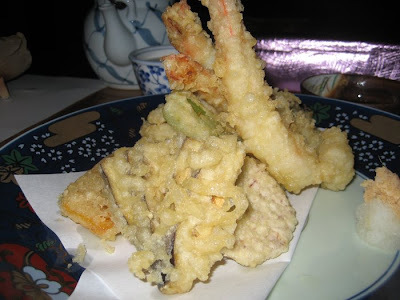 Soft-shell crab. 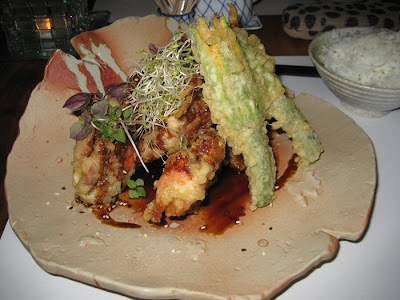 2 crabs and 2 zucchini flowers, deep fried in a crispy batter, with a stickily sweet teriyaki sauce. This was my main meal. Wow! Overall, it was a very satisfying meal. 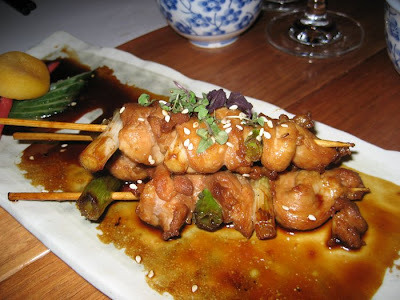 I loved trying new flavours and dishes that weren't familiar to me. The service was great too - the waitstaff were all friendly and professional, and very accommodating for our large group with special needs. The food and drinks arrived promptly, and were, on the whole, delicious. Oh wow Sarah. I didn't even know they had such a large platter of sushi and sashimi. When I went, we already got the large plate I thought. I want to eat that right now. Koko is really good I thought. I too am suspicious of Japanese restaurants are not run by Japanese. 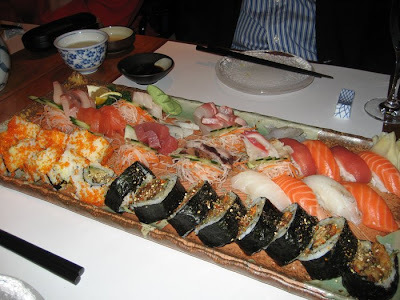 But then lots of cuisine aren't so why does Japanese need to. When I heard the chef and wait staff talking in Mandarin in the kitchen (we were seated near the kitchen) I knew Koko wasn't Japanese. But it turned out to be great still. 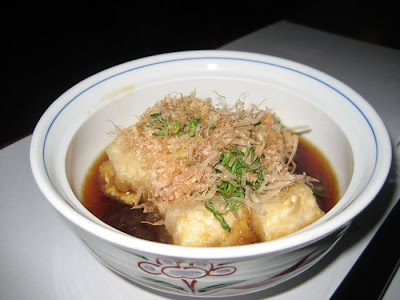 You might find this article about how to tell a real japanese restaurant interesting. At restaurants, I always try to spot whether that place is "authentic". Usually the wait staff are a giveaway. Hearing them talk to each other is the key. The sushi platter was actually a mixture of 3 smaller platters - the soft-shell crab rolls, the sashimi platter and the nigiri sushi platter, I think. We asked for a big sushi platter to start with, so the waiter put one together for the 6 of us. We were stuffed by the end of the meal! Thanks for that link! Very interesting. 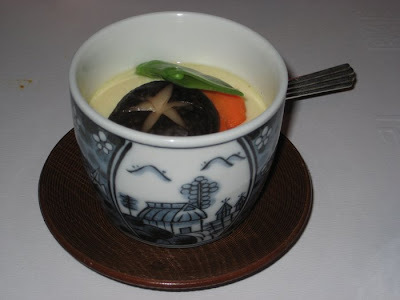 I was also really impressed by Koko's, despite the non-Japanese chef. 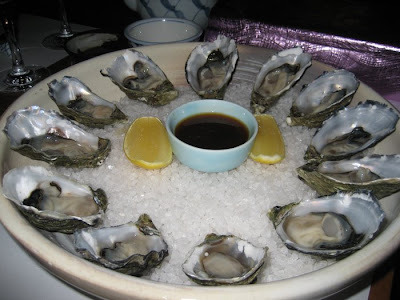 I read at bestrestaurants.com.au that Allan Koh used to work at his family's seafood wholesaling business, so he must know his seafood. And he's obviously passionate about Japanese cuisine! This made me hungry. Those foods looks great and delicious. Thanks for sharing, I really enjoy it!